Pool mosaics vary in complexity of design but without any doubt, this is the way to make your swimming pool one of a kind. Mosaics have a huge history and unsurpassed aesthetic features. Mosaic, as an element of interior decoration, dates back in ancient times. Whether it appeared in Rome, Byzantium, Greece or China is difficult to say, but the fact that people of that time realized that this is one of the most versatile finishing and decoration materials, is a fact. Mosaics were used by the middle class for wall decorating and by the elite of society for refined decoration of palaces and temples with mosaic panels on the walls and floors, even as furniture inserts. The diversity of the mosaics varies from inexpensive glass to mosaics with gold, silver and precious stones. The color scheme options, structure, and shape of the mosaics are really huge, as well as its purpose and type of application – it can be used for exterior and interior decoration. 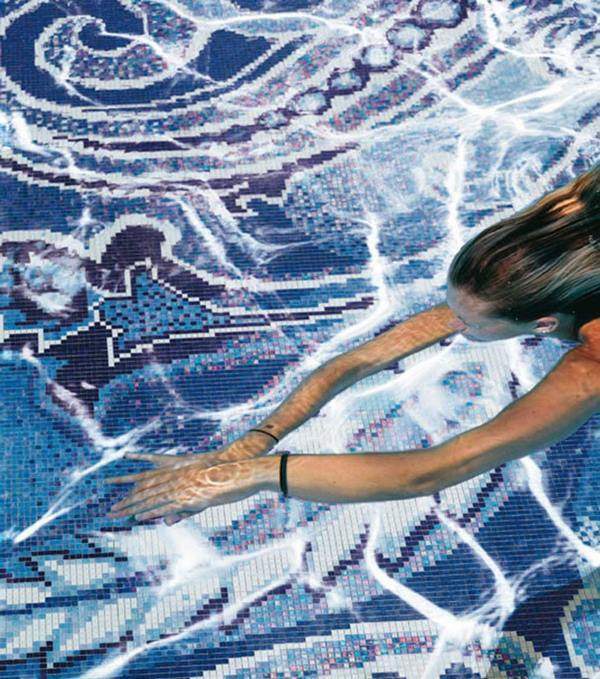 Mosaics have become an indispensable element of the decor in public buildings, for example, in Turkish saunas, hammams and pools and this is in the focus of our attention today – decorative mosaics for swimming pools. Nowadays, there are many requirements for the materials used for swimming pools, saunas, spa-areas, etc. These materials need to meet high standards for moisture resistance, durability, resistance to abrasion and the effects of chemicals. 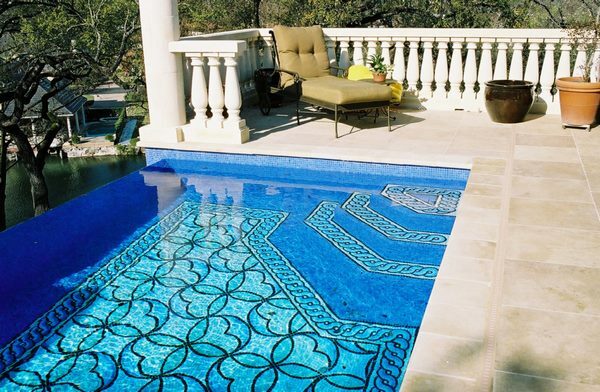 Mosaics are one of the most popular types for pool finishing and decorating. Mosaic tiles have won their popularity due to the fact that they are beautiful and practical. 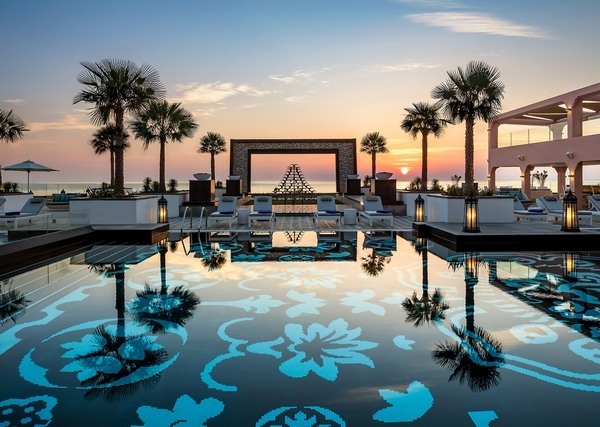 In addition, due to the small sizes of fragments of the mosaics they can be used to finish and decorate pools with non-standard shapes or curves. The range of materials from which mosaics are made is very wide – natural stone, glass, ceramics, etc. – and the wide variety of colors makes it possible to realize any design idea and blend it into any style. 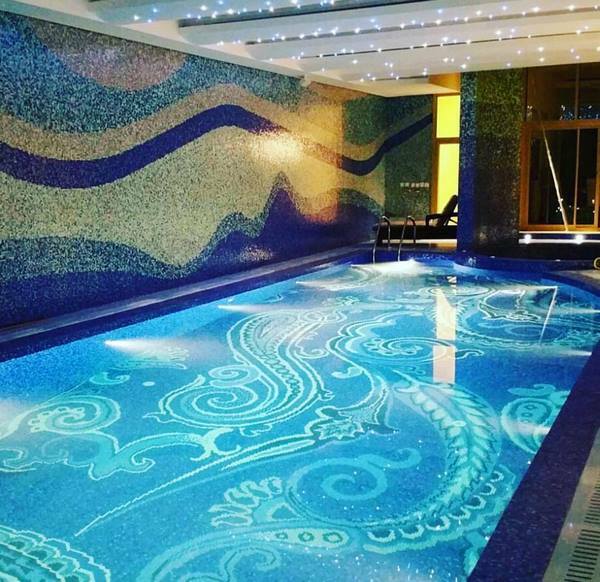 Pool mosaics can be a simple decorative border or a complex and intricate masterpiece which is a real work of art. High-quality material can not be mechanically damaged. Once finished, the design will require special care so that the seams between the elements do not get dark or damaged. 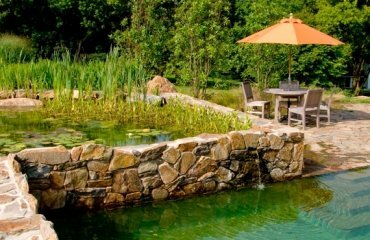 Pool mosaics – how to choose the material of your tiles? Modern market offers many different types of mosaic tiles. They can be made of stone, marble, glass, ceramics, wood and metal. But if we talk about the finish of the pool, not all the listed types of mosaic tiles are suitable. As we said, pool tiles need to have certain characteristics and in addition, you need to take into account that the material will be in constant contact with moisture. Depending on where it will be used, various agents can be added to the composition of the mosaic chips. 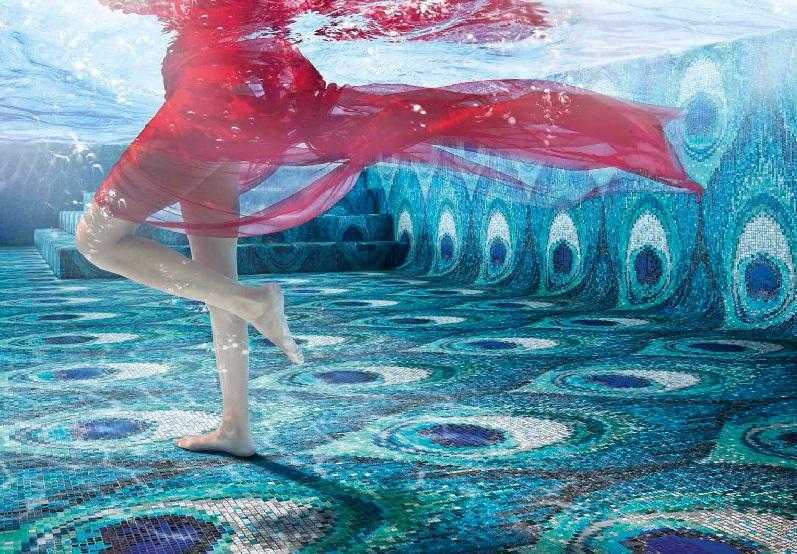 For example, anti-slip floor mosaic is traditionally used in public or children’s pools, where it reduces the risk of injury. 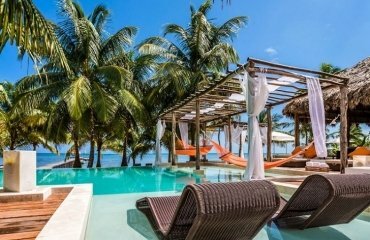 We will look at the pros and cons of some of the most popular pool tile materials so you can understand the difference between them and choose accordingly. Glass mosaic tile offer a number of advantages which make them one of the top choices for pool finishes. 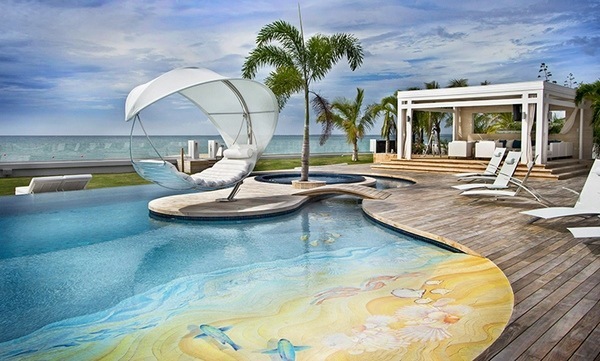 They are versatile, and will add not only value to any swimming pool but a unique visual appeal. 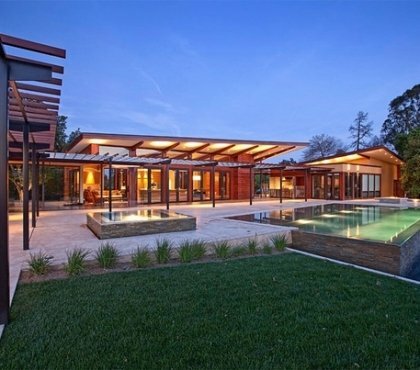 Durability – glass is non porous and environmentally friendly. Tile can be manufactured from recycled materials. Glass is resistant to stains, mold and mildew, chemical damage and its color is not affected by water or sun rays. Glass mosaic tiles are easy to clean. Simply wipe away dirt with a wet cloth and some mild detergent. Because dirt shows easily on glass, you will always know when to clean. Glass mosaics will not develop stains. Glass is also resistant to chemical damage. It can last a long time. 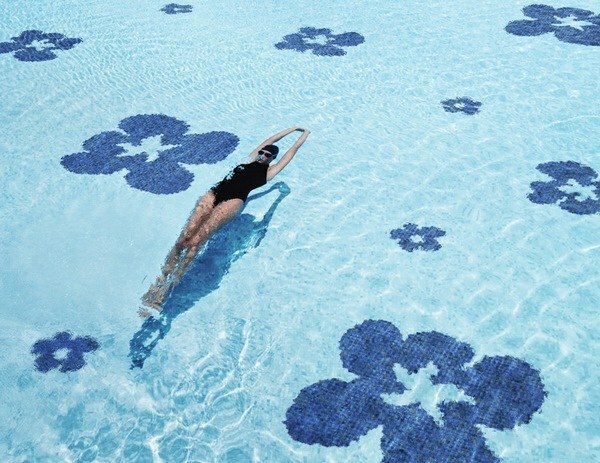 Visual appeal – compared to alternatives, glass tiles add exceptional style, elegance and beauty to the swimming pool. You can choose any shade – blue, turquoise or green – which will remind you of the sea or create exceptional designs featuring marine fauna and flora, ships, waves, etc. The enormous variety of colors, shapes, sizes and patters makes them suitable for any swimming pool. Even if you work on a tight budget, you can combine glass mosaic tile with other materials and benefit from their gorgeous reflective surface. As much as glass mosaic tile is a top choice, they have some shortcomings. Their major disadvantage is the high price. 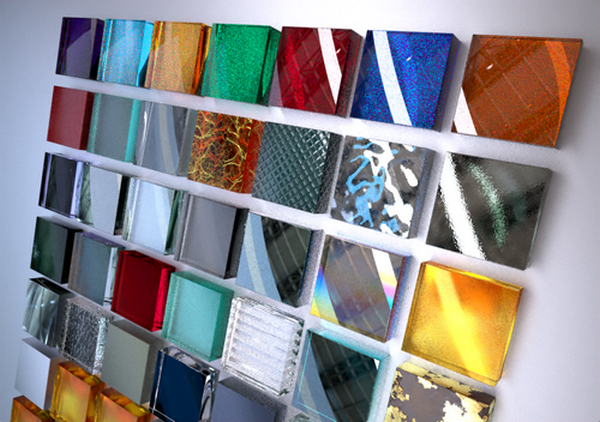 Glass mosaic tiles are considerably more expensive than ceramic or stone tiles. Glass is susceptible to scratches, which ruin the appearance of the tile, respectively of your beautiful mosaics. Hiding scratches is very difficult, even impossible. Installation of glass mosaic tile is a labor and time consuming process which requires considerable skills and expertise and if you want a perfect pool decoration you need to hire professionals. 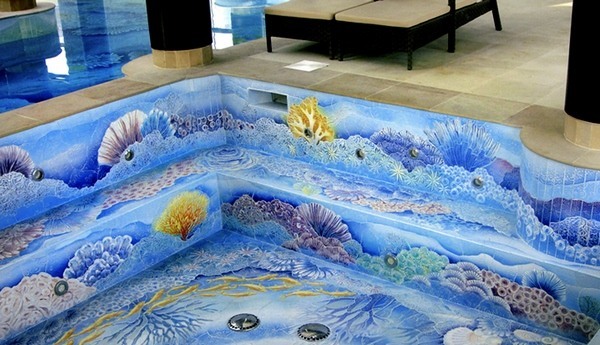 DIY installation is not recommended, especially, if you want to create an intricate pattern or more ornate pool decor. Glass is slippery when wet. This is a serious concern if you use them for pool stairs, so make sure that the surface is treated with a non-slip sealer. Ceramic products have been used by man for thousands of years and still have not lost their popularity. Of course, with development of technology, the quality of the tile has improved and new elements are added to the compounds, which significantly improve the characteristics of the material. 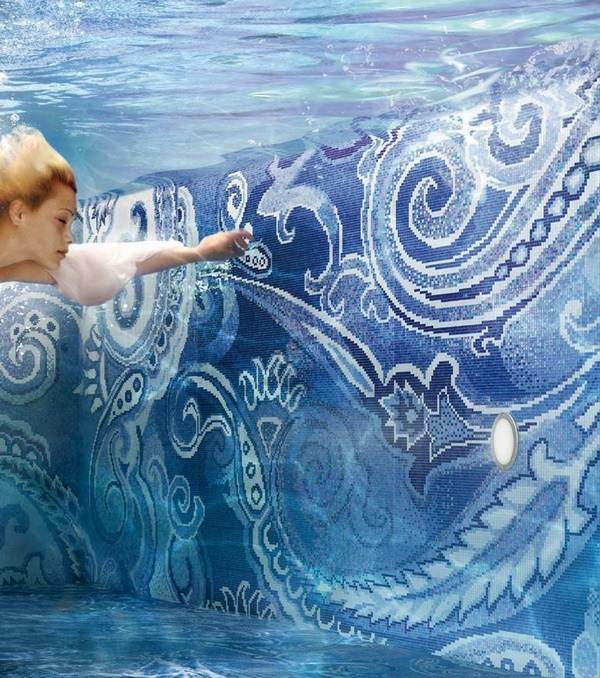 Pool ceramic tiles differ in composition from the ones manufactured for kitchens or bathrooms. This is the least expensive option, yet when the tiles are of high quality they will offer you many benefits. Ceramic tiles, however, also have their drawbacks. They are not as hard and non porous as porcelain tiles. In case ceramic tiles crack, get scratched or their glazed surface damaged in any mechanical way, they lose their resistance to water damage as well as the beautiful appearance and the overall visual impression of the mosaics is likely to be ruined. Although not a major drawback, ceramic tiles do not come in such a a vast choice of color options. This can be a challenge depending on the particular poll mosaics design. In addition to that, it often happens that color varies from lot to lot which can be a serious problem if you need to replace a tile or buy an additional quantity. Ceramic tiles can be very slippery if they are wet so if you consider using them as pool decoration, it is a good idea to use them on pool walls, instead of entry stairs. 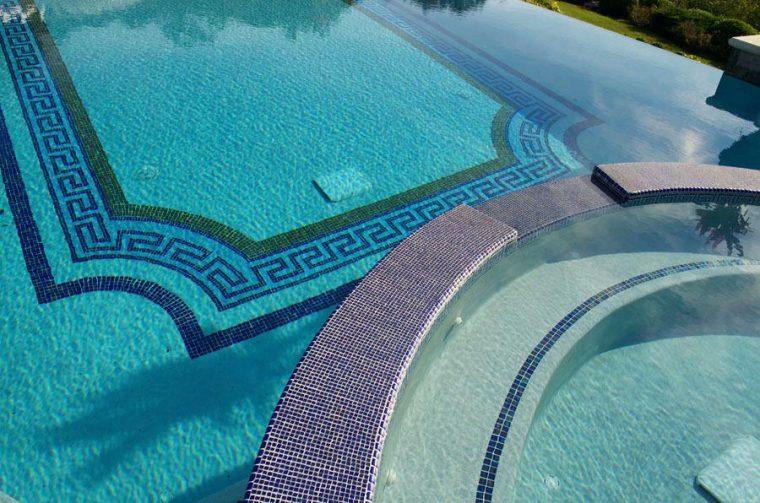 Custom made mosaic tile for pools are the choice of those who would like to create a unique design and decoration. 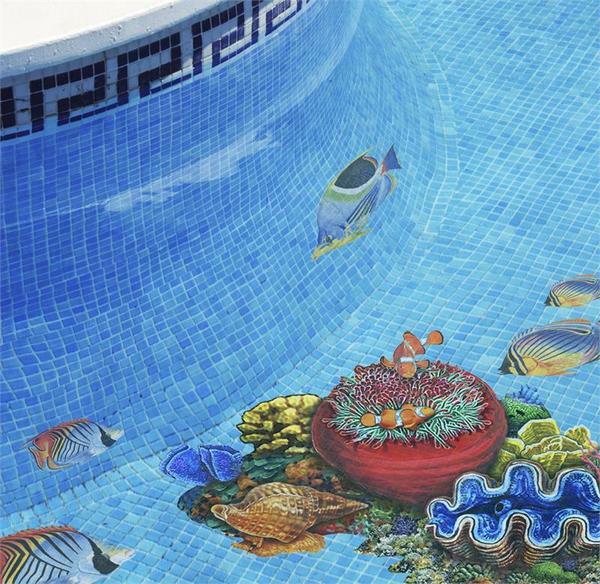 Custom made tiles are the best choice for artistic projects and compositions and the choice of many pool designers as they have exceptional qualities and can be used for three-dimensional mosaics designs. Most often pool owners choose them when they want a special and individual design – logos, special symbols, etc. How to choose your pool mosaics tile? 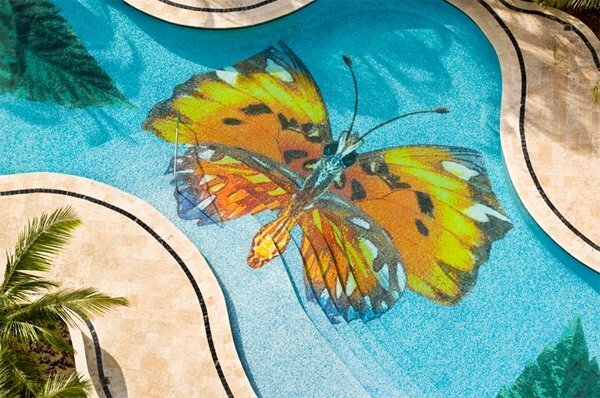 In every pool mosaics, even the ones with the simplest colors are unusually beautiful. The reflection of sun rays’ light is amazingly fascinanting. 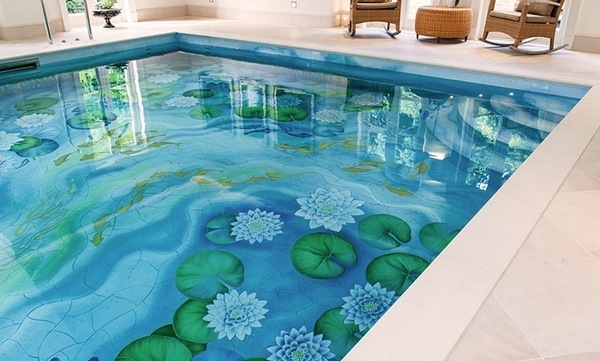 However, when you search for pool tiles you need to chose carefully so that you have the best possible result. Mosaic tiles come in a variety of sizes. Small sized mosaic tile (1,0х1,0 cm) are versatile and suitable for numerous decorative designs. 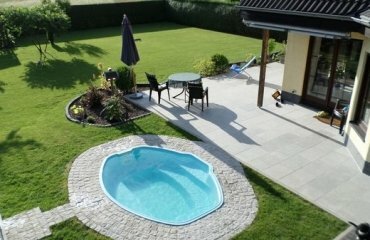 However, the small size means a lot of seams with grout and pool owners are aware of the fact that seams are the problem place in the pool. Larger tile is easier to install and there will be less joints but less design opportunities. 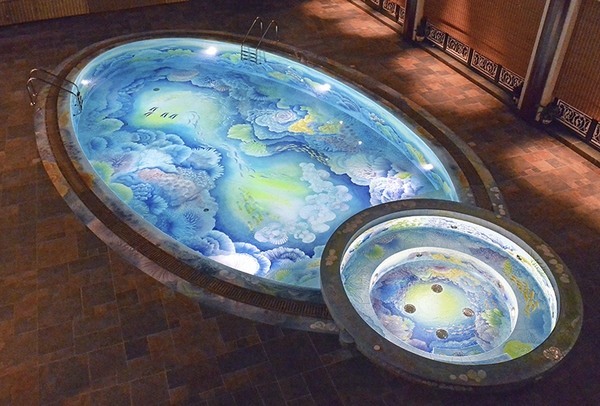 In general, the small size of the mosaic tile makes it possible to decorate the bowls of complex shaped swimming pools and create colorful murals both on the walls and the bottom of the pool shell. 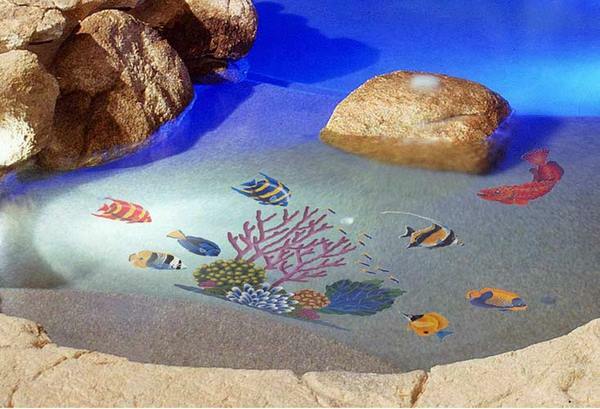 Pool mosaics can be designed in one or multiple colors. It depends on your personal taste and sense of style to choose a more restrained color palette or select a more colorful option. It is not advisable to choose mosaic tiles in different colors for the bottom and walls. 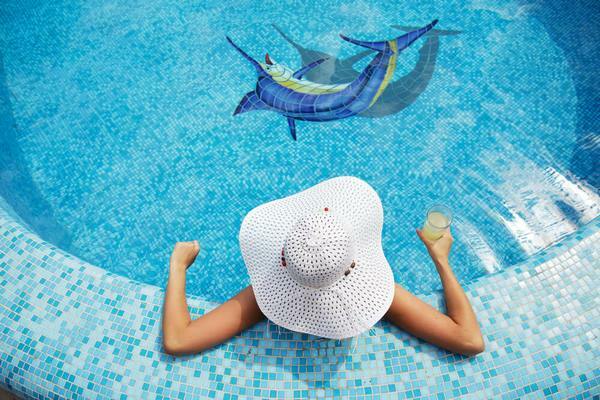 Quality is essential when you choose pool mosaic tiles. It affects the durability and lifetime of the tiles as well as the appearance. Smooth surface, clear color and lack of pores are the main characteristics of high end tiles and they guarantee that your swimming pool will be resistant to contamination, mold, mildew or microbes. 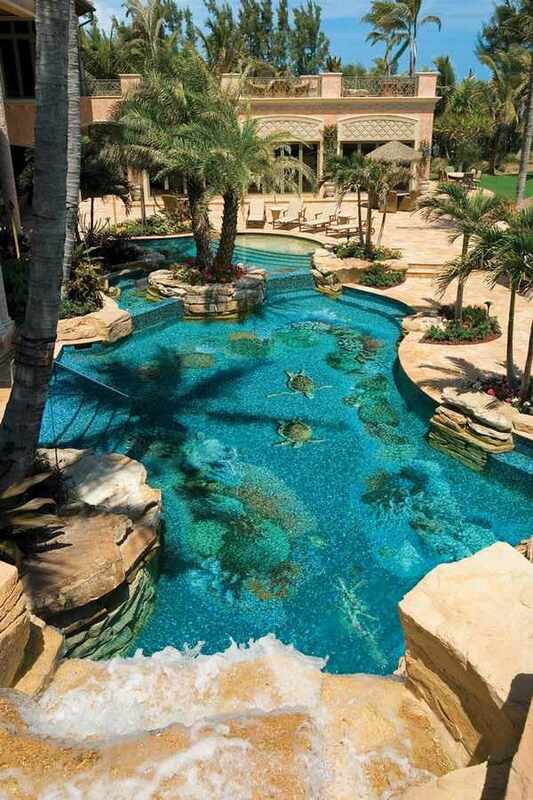 When choosing the design, make sure it blends with the pool surroundings and landscape (or interior). Trusting a professional is a good decision, especially if you find it difficult to decide on style and color. Carefully compare prices as this is often (although not always) a sign for the quality of the mosaic tiles. 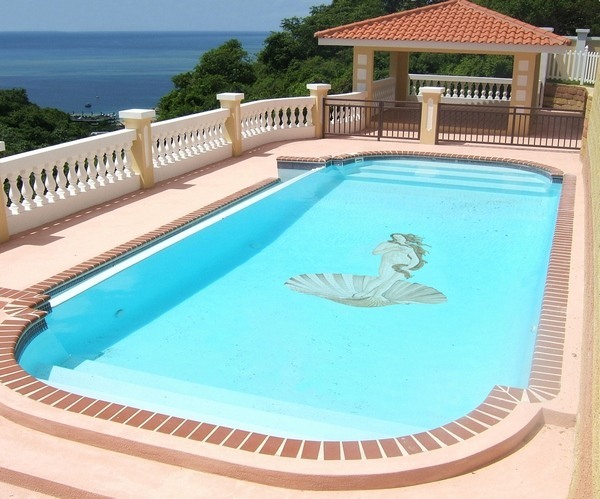 After all, this is a serious investment and you would not want to compromise on the quality and visual appeal of your swimming pool. 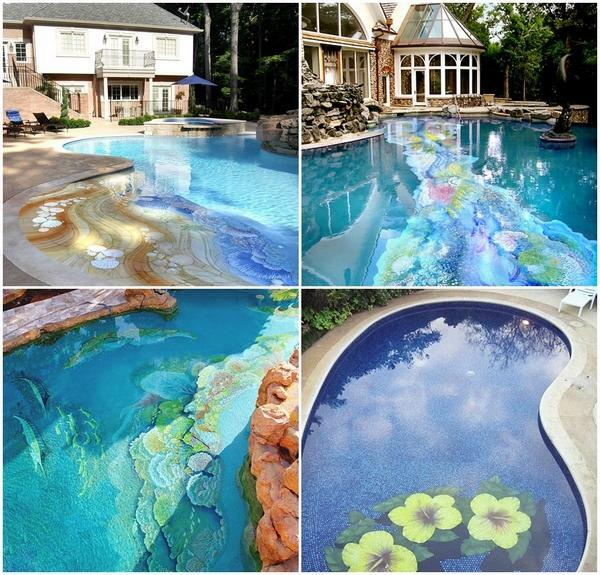 Look at the photos of the most fascinating and amazing pool mosaics in the gallery below and see how inspiring and exceptional these designs can be!